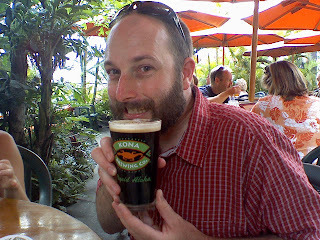 Found out some cool info about Kona Brew Co. The Kona location brews for local bottle and keg distribution, for their restaurant here, and for the Oahu (Hawaii Kai) restaurant location but all mainland brewing and distribution goes through Oregon (Widmer). Makes sense considering shipping would be outrageously unchillindamos. They are also working on an East Coast brewing and distribution location. If you've never had their Wailua Wheat, its quite the summer beer being brewed with passion fruit. ALTHOUGH, the Wailua Wheat here uses lilikoi fruit and the mainland version uses a passion fruit available locally. After having Wailua Wheat enthusiastically on tap on the mainland, I can say that the island recipe is insanely more amazing. Here, I'm having their Dryside Stout. Kona is on the dryside of the island with the other side, the Hilo side, being one of the wettest in the world. I'm unsure of the attenuation of this stout but I think its the driest beer I've had thus far. Aloha! I'll ask if we stop by again. Not a bad place to be brewing!